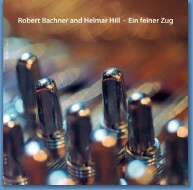 My latest CD "Ein feiner Zug" together with pianist and composer Helmar Hill is out now! It contains a wonderful, new concerto for trombone and piano written by Helmar called "Ein feiner Zug". It is a 3 movement composition and has a classical structure, but also provides jazz solos for trombone and piano. Sheet music of Helmar´s "Ein feiner Zug" concerto at ATS-Records. Listen to a high quality audio file of the full 1st movement here. New Robert Bachner Big Band DVD "Live in Vienna" is out now! It contains exciting originals, wonderful songs featuring Karin Bachner and also some spectacular Buddy Rich big band classics. Order DVD online at ATS-Records. Get CD version in iTunes. Sheet music of Helmar Hill´s great trombone concerto "Ein feiner Zug" is now available at ATS-Records. If you have not got our duo CD "Ein feiner Zug" yet, you can now also order a nice combo of sheet music & audio CD at a special price there. If you want to have a listen first, please download a free, high quality mp3 file of the 1st movement here. To learn more, read this nice review at rateyourmusic.com. All my CDs are also available for download in iTunes. The files don´t have any DRM (Digital Rights Managament) and are playable on almost any modern player. The audio quality is great, the format there is: mp4 audio, 44,1 Khz @ 256 KBit/s. In the Nov/Dec. issue (#6/2007) of the german magazine sonic I also had a very nice (and quite long) interview, done by Carina Prange. If interested you can download this article as a PDF file here. By the way, Carina also runs her own, very nice jazz website called jazzdimensions.de. Maybe have a look and also read some other nice interviews and reviews there.